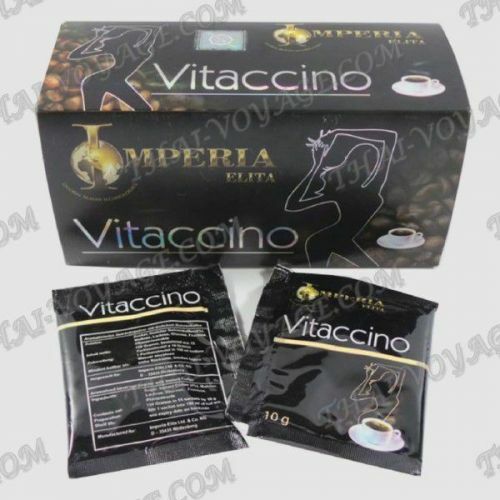 Vitaccino Imperia Elita is a 100% natural coffee that combines two of the most successful slimming products – Baian Lishou slimming coffee and Vitaccino Imperia Elita slimming coffee. As a result, a new slimming coffee Vitaccino Imperia Elita, made of African-Ethiopian black coffee Moyojava, soluble low-fat milk and natural extracts for weight loss Hunger-obliviongrass, Griffonia Simplicifolia, Tuckahoe and immature oranges. Vitaccino Imperia Elita coffee for weight loss accelerates metabolism and fat burning in the body, increases the feeling of satiety and suppresses appetite, helps with detoxification of the body and treatment of the gastrointestinal tract. Ingredients: Hunger-obliviongrass, Griffonia simplicifolia, Tuckahoe, unripe orange extract, instant African coffee Moyojava, low fat milk, sugar. Application: 1 sachet diluted in 150 ml of hot water and drink in the morning before or after Breakfast. The maximum daily dose is 1 sachet. Contraindications: it is forbidden for children, pregnant women, nursing mothers, people with heart or kidney diseases. In the package: 15 bags of 10 grams.